PS4RS is out with their top-six picks. Anthony Lubrano has endorsed his favorite three. The 2013 trustee race is getting some clarity. After last year’s election, my wife, who’s a statistics wizard, plugged some number into her computer and came up with the following observations: the alumni preferred candidates who were older than me (I’m almost 34 years old) who live in areas with large alumni populations (State College, for example). Ballot position was also helpful. I don’t think there’s a direct preference for older candidates however. Instead, I think there’s a general tendency to support candidates with “substantial life experience,” to borrow a phrase from PS4RS. That translates into people who have fancy titles on their resumes like “president” or “CEO.” Positions like that are impressive. They’re hard to come by, they illustrate one’s corporate leadership experience and they demonstrate the drive to achieve one’s goals. Many sit on company boards, and therefore have “board experience.” Based on title alone, a corporate executive seems like the perfect candidate. But there’s one glaring problem with such a shallow candidate analysis: the board was filled with corporate executives in November 2011. They failed us miserably then, and have continued to fail us ever since. How is it that somebody so qualified to lead Penn State turned out to be so wrong? The corporate executive candidate is certain kind of leader. He works in the private sector. He’s good at making management decisions that fuel higher profits. Meetings are held, and management decisions are made, behind closed doors. He only has to build concensus with a few high-ranking corporate officers, and only answers to his board of directors. He is not scrutinized by those outside the company, and can usually ignore criticism from pretty much anybody. Contrast that position with the role of somebody who serves on a public board. Major decisions are made during public meetings, during which the public has the right to lob a never-ending barrage of criticism. Building consensus among board members is key, but you’re ultimately accountable to the voters who elected you. Your job isn’t to make more money – it’s to further and enhance the mission of the institution, a goal whose path to achievement is far less clear. In truth, the corporate executive candidate is really the antithesis of who the public candidate should be. Every day, he thumbs his nose at transparency. He doesn’t have to worry about fostering a culture of collaboration and openness. Those qualities just isn’t natively in his blood. That’s why I’m starting to cringe at the emerging support for the corporate executive candidiate again. In order for a BoT member to be effective, they need a demonstrated leadership capability and an ability to effect change as part of a minority group on the board (I particularly liked that question). These people need to be able to go toe to toe with heavy hitters some of whom are CEO’s (Ken Frazier e.g.) of large companies … in order to do so, leadership positions/experience in industry is essential. After reviewing the 6 candidates, I feel confident that 3 will emerge to help Anthony on his/our quest. Can[‘t] wait to get 3 more next year. This person believes the best person to fight Ken Frazier is another Ken Frazier. He wants somebody who can schmooze the other size, and will be charming, conniving and cunning behind the scenes. He wants someone with a much power as Frazier, because he assumes Frazier will only bow to somebody with as much, if not more, power than himself. The problem with that people like Ken Frazier don’t understand the difference between the Board of Trustees and Merck’s Board of Directors. They don’t understand the benefits of transparency. They don’t understand the ethical differences between public and private board members. It’s just not part of their daily lives. 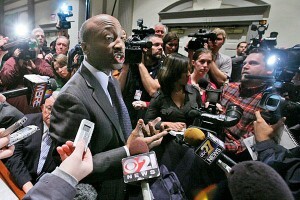 A Ken Frazier will not convince Ken Frazier he needs to change. People who aren’t corporate executives don’t bring with them entrenched values of secrecy. Their daily mission isn’t to make as much money as possible, and their routine decisions aren’t made with that in mind. They bring a completely different set of skills to the table that this board is lacking. As you’re making your final choice for Penn State trustee, be sure to cast your vote for somebody who shares your values. Don’t be fooled by fancy titles. Do your homework. I agree Ryan. I also think that throwing a corporate mindset into the Sandusky issue and its aftermath has made things much worse. I truly believe most of those on the board on 11/9 honestly felt that firing Paterno and Spanier would end the problem. And then when it only made the problem worse, they closed ranks and the exec committee has made every decision since then. They seemed to believe that throwing PR slogans like One Team and Faces of Penn State would be enough. I think they quite wrongly saw accepting the Consent Decree as a smart PR move that would cost a little bit of money in the short term, but do more good than harm. Sadly, they seemed to have missed the concept of a University being unlike a corporation that sells a necessary product. PSU has competition from hundreds of other Univeristies, and the investment in a college education is second only to that of purchasing a house. Allowing Freeh, Emmert, Erickson, Peetz, Frazier, and Dambly to denigrate our “culture” has devalued the PSU education to that of a crumbling shack on the border between the ghetto and country club. And I just don’t see an understanding of this from a good portion of the corporate trustees and some of the alumni trustees. Myers and Clemens are the only two old guard who have shown that they get it. However, who is to say that the leadership/experience needs to come from the corporate sector? Why not people who have demonstrated leadership of a non-profit/not-for-profit/charity where the stakeholders are much more varied and the stated goal isn’t necessarily just the bottom line. Why can’t faculty leaders, former educators make better candidates than former corporate CEOs? If being on the board of a University is equivalent to a public service, why not pull more people with experience in public sector rather than the private sector? Leadership and experience come in all sorts of shapes and sizes. I’m sure people selected Ryan McCombie more for his experience as a Navy Seal than any other corporate background. And certainly one of the best ways to avoid the groupthink mentality is to have a diverse range of backgrounds and views. I always laugh when I hear people say things like “please do keep plugging along – every year you add more experience.” I heard the same thing last year. So I always have to ask: experience at what? Life? Doing CEO things? There’s never a specific complaint, but for some reason, the title makes the person appear to be a leader. Election by title hasn’t worked out for us so well though. This post wasn’t about me, however. It was about the perceived tendency among voters to make corporate executive experience a prerequisite when there are plenty of other non-executives out there that would serve the university just fine, if not better, than the typical corporate executive. Take me for example. Here’s my experience: I run/manage an office space for freelancers that I helped found last year. I sit on the board of the local alumni association. I have more experience in dealing with public boards than most, if not all, other candidates, both out front and behind the scenes. I have a demonstrated record of forcing organizations to be transparent. I am perhaps the only candidate who knows what systems Penn State needs to actually become transparent. I’ve demonstrated I’ll fight tooth and nail for the release of every scrap of paper that sheds light on the Sandusky scandal. Shouldn’t that enough? The answer is of course yes. But there’s a perception that the corporative executive would represent alumni better than somebody with a demonstrated ability to get things done. No matter who is elected, I hope we elect people with the right experience – whatever that is.